Helena has thrown a Token Bingo Party so you can acquire more Tokens that you can use for your Avatar customization in the Crew Hangout! 1. Log in everyday and receive 5 Bingo Ticket! 2. Acquire maximum of 30 Bingo Ticket daily when you play 3on3 Matches. 3. Draw numbers in the bingo board using your stacked chocolates. ** Numbers in the bingo board is ranged from 1 to 49. ** You will not get the same number again. 5. No Tickets will be given once the event is over. But you can still use your accumulated ticket in the event screen. You can also win Platinum and Gold Card pack from this event. 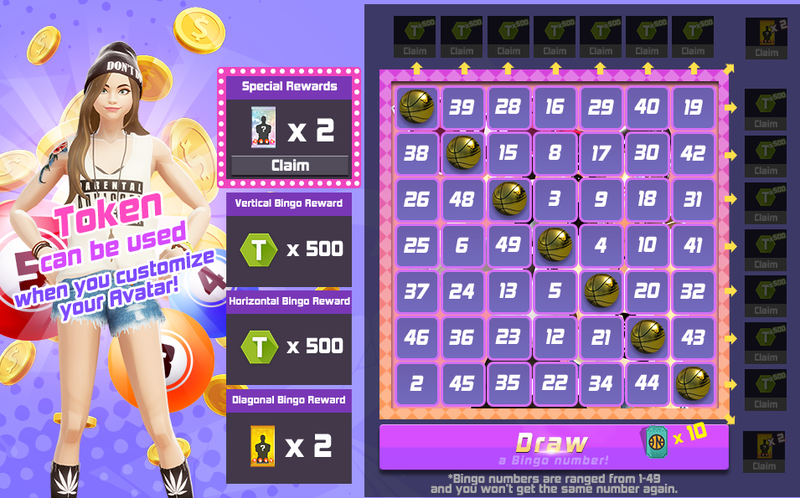 Let us all cheer, collect bingo tickets and enjoy awesome rewards!